These days, when we compare discourses of humanitarian assistance, it is astonishing how many states use the formula of a ‘humanitarian tradition’ to describe past actions and indeed influence current debates (see examples with critical discussions from Britain and from Switzerland). Wo liegt die Humanitäre Schweiz ? Eine Spurensuche in 10 Episoden accordingly conducts research into the history of the concept in Switzerland during the 19th and 20th century. The book is divided into five sections, each representing a specific dynamic at a given time. First it sheds light at the period in the wake of 19th century, when forms of organized assistance took shape in Switzerland. Even before the foundation of the Federal State in 1848, there were coordinated activities between the cantons in case of natural humanitarian disasters such as fires, landslides, or floods. Second, it looks at a period better known as a great moment for humanitarian action in Switzerland—the Franco-Prussian War of 1870-71. During the war, the Swiss population, the International Committee oft he Red Cross (ICRC), and the government undertook help for refugees, wounded soldiers, and civilians. This moment when the young Swiss state and the young ICRC began to operate – albeit not always in harmony – witnessed the first desire to essentialize humanitarian assistance as a nascent national trait and to use it as a publicity tool for domestic political as well as international ends. Third, the book delves into the process of legal regulation that shaped the humanitarian sphere in the first half of the 20th century. This process culminated into the famous quote that ’rights, not charity’ were needed after the First World War. Even though the discourse of the humanitarian tradition of Switzerland was largely founded in these days on the assistance the country had provided during the First World War, it is also noticeable that juridification of humanitarian norms arose amid competition between countries. Switzerland saw itself as playing a prominent role in this competition. Fourth, the book discusses the professionalization of humanitarian help from the 1940s onwards. 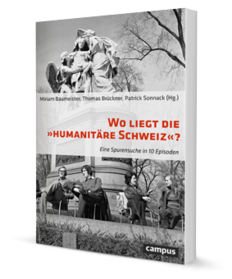 The discourse of a humanitarian tradition was deeply ingrained into new institutions and into the education of both, humanitarian professionals and students and thus, became a globalized brand of Swiss humanity. As Daniel Speich, one of the authors, notes at the end of his contribution, the discourse also entailed a Western arrogance and the legacy of colonialism. The fifth and final section looks at a phenomenon which most readers might connect with the concept: the sphere of politics. Taking debates in Switzerland on migration policy in the 1970s as a starting point, it shows how the concept served policy makers to put forward proposals or to legitimize measures. Under this condition, the concept bears little value for historical research. The application of the concept itself, however, shows a pattern inasmuch there is a ‘tradition of appropriation’ in the description of humanitarian behaviour. Wo liegt die Humanitäre Schweiz? is an experimental book that sheds light into particular structures and events within the history of the Swiss humanitarian tradition. It connects views from practitioners outside of the field of history with historical expertise from renowned Swiss scholars. The book conducts not only research into the birth, the change, and the conjuncture of the political concept of a humanitarian tradition, but also provides answers on the scope of influence of this concept. Thus, it informs discussions about humanitarian policy that prevail in many countries at the beginning of 21st century. In this you will find statements from some of the authors. Dr Thomas Brückner completed his doctoral dissertation on the relation between the ICRC and Switzerland in 2015 at University of Zurich. He studied History, Political Science and Sociology at Free University Berlin, London School of Economics, and École des Hautes Études en Sciences Sociales.